Master cylinder may be leaking fluid past the piston seals internally (by passing), not building up pressure. When diagnosing a master cylinder, keep in mind the type of seals that are used are lip cup seals. This design allows for the seal to improve as the pressure increases. Another feature of this seal is that it does not create a vacuum when the piston retracts. 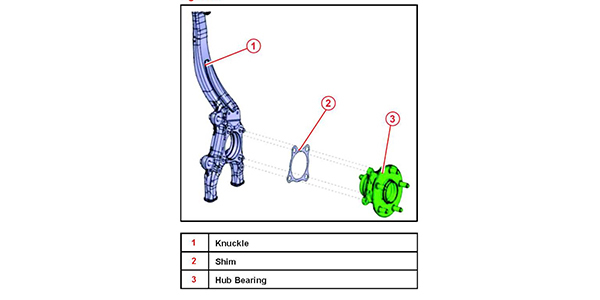 As the pedal is depressed, the piston is pushed in the forward direction. 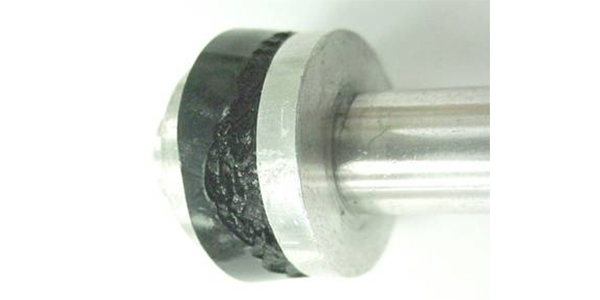 The lip cup seal, attached to the primary piston, builds pressure up in the primary chamber first, which in turn forces the secondary piston forward, building pressure in the secondary chamber. 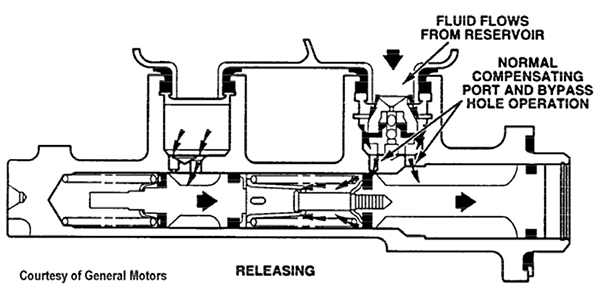 As the pressure increases in both chambers, the edges of the seal are pressed against the bore of the master cylinder. The higher the pressure, the better they seal. In the manufacturing process, the testing procedure for master cylinders is done at low pressure. 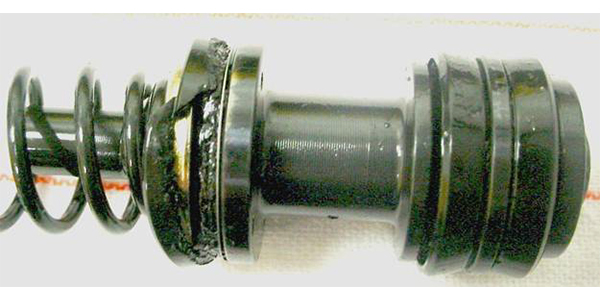 Lip cup seals are more likely to fail under low pressure. 1. When diagnosing the automobile hydraulic system, the first thing to do is perform an isolation test. 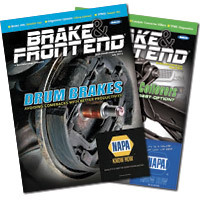 Use the proper tool and clamp off all the hydraulic brake hoses. 2. Press down on the brake pedal. If the pedal is low or spongy, remove the brake lines from the master cylinder and install plugs in the outlets. 3. Press down on the brake pedal. Release the pedal and wait approximately 10 seconds. This allows the quick take-up valve to open and the air to escape through the master cylinder compensating port and the fluid in the reservoir to enter the bore of the master cylinder. Once air stops coming up into the reservoir, or the pedal becomes firm, apply light pressure to the pedal and observe if the pedal continues toward the floor. 4. When the master cylinder ports are plugged, and the air is bled out of the bore, the pedal should be high and hard under low pedal effort or high pedal effort. If the pedal sinks under either condition, the seal is damaged and the master cylinder should be replaced.